Old Missionary Gary was so, so, so pleased to welcome his cousin, Missionary Robert Hansen from Wakefield, Nebraska for a special tour and visit. Robert Hansen is the son of Chester Hansen, who was a brother to Gary’s mom. We always got along so well, because Bob would always wear bib stripped overalls, which is the “trademark” of old Missionary Gary, because his dad always wore them. Yes, Bob came with his son Dale, and his daughter Trudy and her husband Jerry. 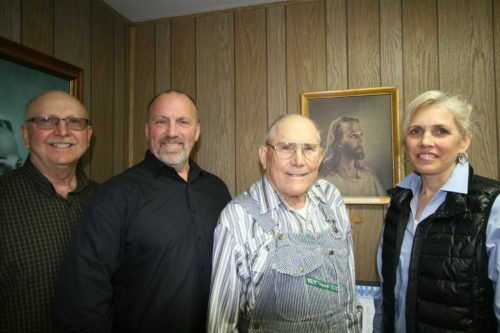 From the picture taken in Gary’s office, you can clearly see who Bob is and his family….and they were happy to have their picture taken in the office with our Boss in the background!